You see this green suit from ASOS, right? You, also, see the bike. Ok, so check it. 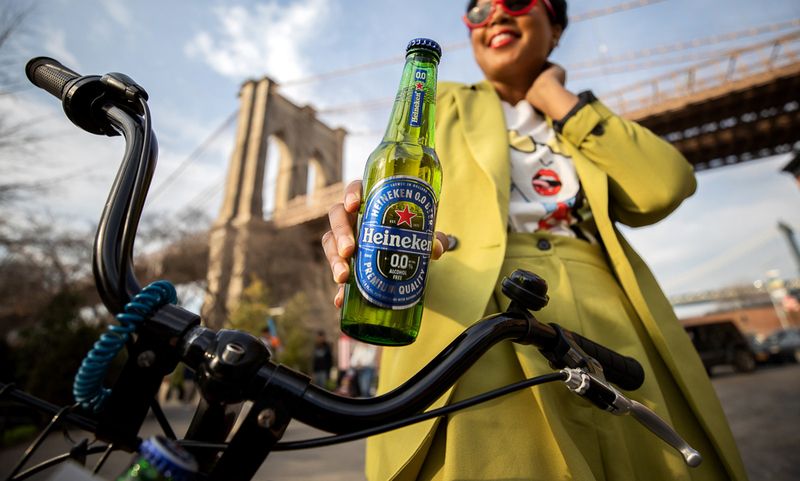 The bike didn’t just magically appear in front of the Brooklyn Bridge on the first real Spring day of the Season. Oh, no, ma’am. Let me explain. This Green Suit Is A Keeper. Here’s Why? 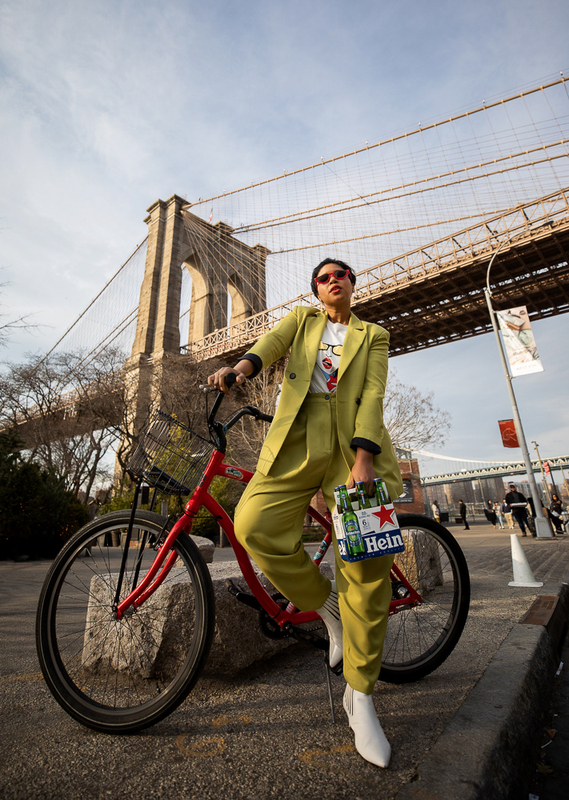 I had the brilliant idea of wanting to get a bike photo in front of the Brooklyn Bridge to shoot this Heineken 0.0 campaign. Great idea in concept, TERRIBLE idea in execution. Now, it’s no secret, I’m a chronic over-thinker. At times, I don’t always see the easy solution right away. It takes me a few tries and this day was a PRIME example of taking the hard way out. After a few hours of research, I located a bike rental place that appeared to be close to the Brooklyn Bridge. It was located in Manhattan at Pier 17 and I was wrong. Are you following, so far? The bike and Brooklyn Bridge are no where near each other. Got it? Ok, cool. 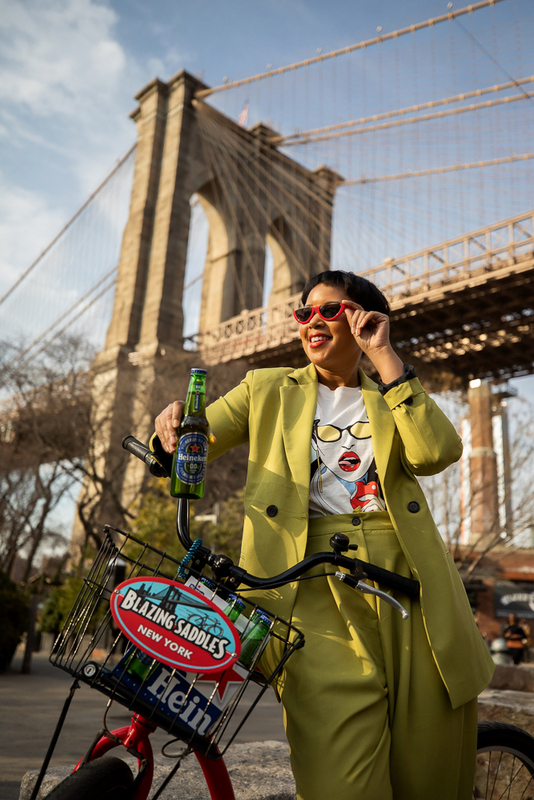 The women at the bike rental shop tells me that getting the bike over to the Brooklyn Bridge Park where I wanted to take the photos was pretty easy to accomplish. So, I show up ready to do what it takes because I’m a do what it takes type of bih. I show up with this green suit on ready to take on this challenge. (Ok, this is getting long for no reason let me hurry up and get right to it). I pay for my bike and head off with the map that was given to me to RIDE THIS BIKE across the Brooklyn Bridge. Let me reiterate that it was the FIRST real Spring day of the Season in New York which translates to EVERY single body and their mother being outside to soak up the good weather. More specifically, everyone was on the Brooklyn Bridge. Picture it. 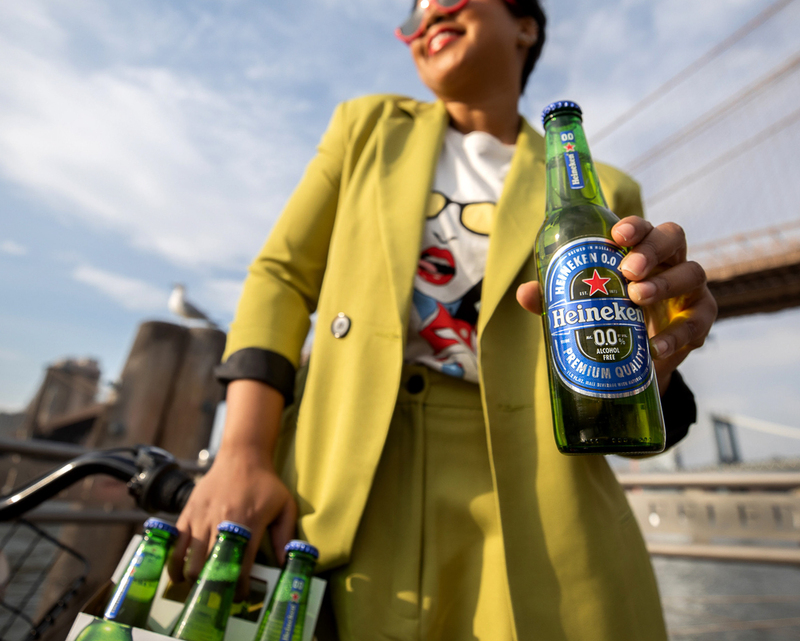 I haven’t been on a bike in a little over four years and I’m trying to get my balance together while pushing through the entire population of New York on the Brooklyn Bridge. I am sweating. 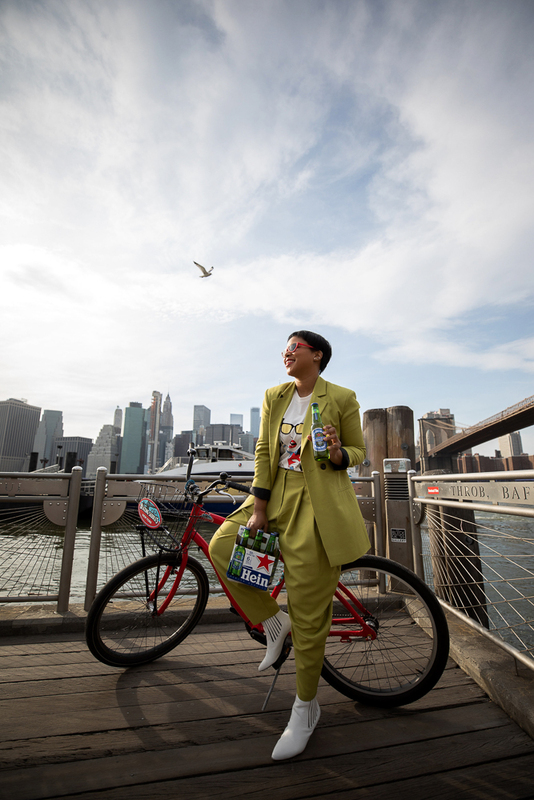 The wind has literally said and I heard it “I don’t give a f*ck about this little hairstyle that you thought you had when you left the house” and I’m getting a workout that I wasn’t fully in the mindset to receive to get this bike across the bridge. Long story, longer! I have now fought my way across this bridge. I have yelled and rang the little stupid bike bell at millions of aunts, uncles, grandparents, sisters, brothers, mothers, fathers, and babies in stroller. No one was off limits because, at this point, I couldn’t turn back. 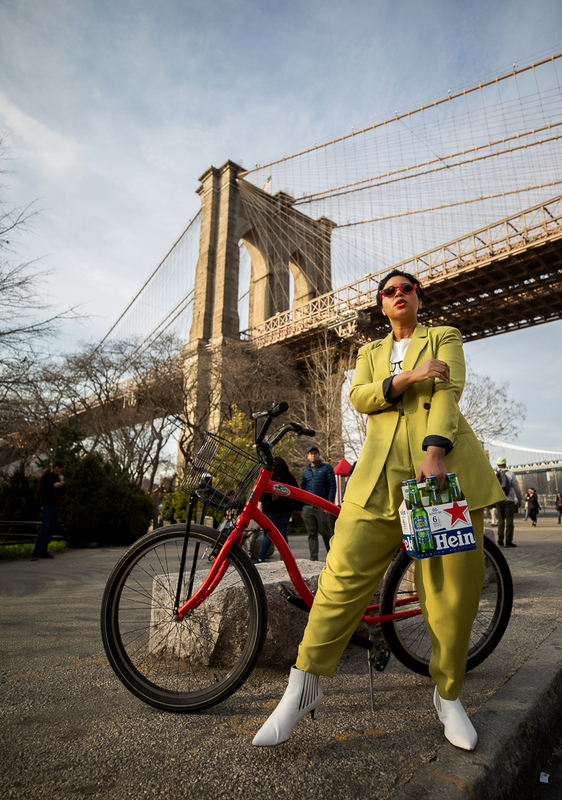 I was committed to the goal of getting this bike across the Brooklyn Bridge to get these photos and getting them was what I was going to do. I am, after all, goal oriented. Obviously, after some blood, sweat and tears ( I was on the verge but I didn’t want to ruin my make-up), the mission was accomplished because you can see the final results above. However, please know and understand that this was one of the top three stupidest things that I’ve EVER done in my life. 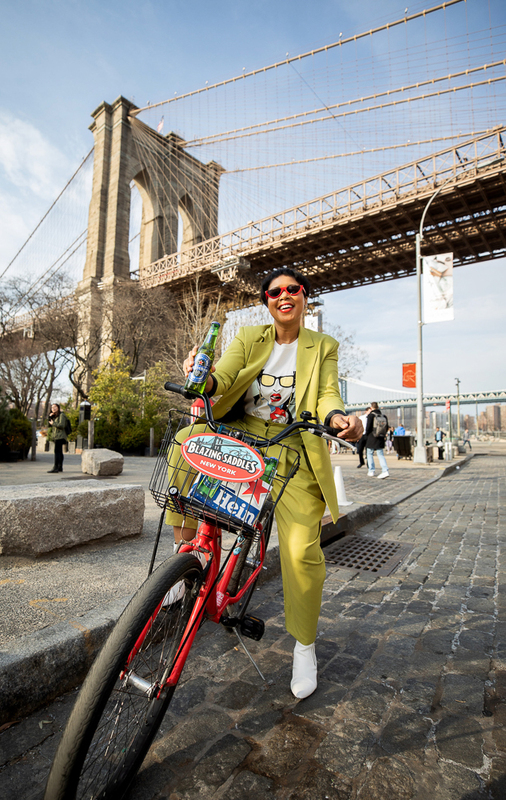 If you can learn anything from me and this situation, it is to never in all of never-dom ride a bike across the Brooklyn Bridge on a Saturday of the first real Spring day of the Season. 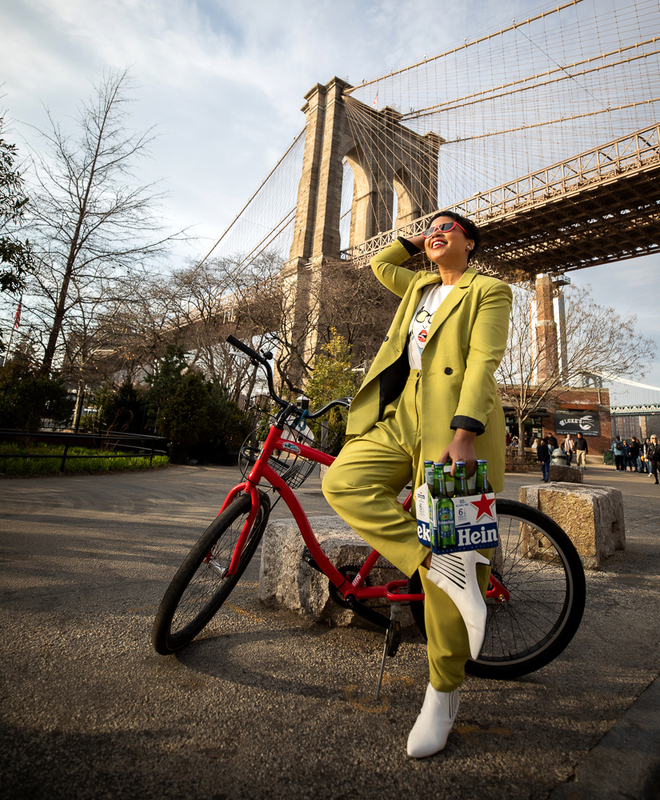 More importantly, this green suit from ASOS took this Saturday afternoon Brooklyn Bridge beating like a real G. Looking at this photo, you probably couldn’t tell that the suit (and I) had been through such an ordeal. I think that’s the goal with clothing. You want them to be able to withstand the test of time and handle life’s hurdles. I, for one, can tell you that this green suit from ASOS is 100% up for the challenge.